Land and water together form a necessary supportive fabric. "We all live downstream on round river." Knowing that land, air, and water are inherent and inseparable entities that make life possible is the initial step to becoming ecologically literate. They form the acronym: L A W, representing a universal quality of nature that both restrains and creates opportunity for all living creatures simultaneously. Then realizing what experts, like Aldo Leopold believe, is the secondary step to becoming ecologically literate. Understanding their meaning and symbolism can be another step toward developing an ecological imagination. The importance of allegories and symbolism in nature writing is not to be overlooked. Leopold, in Thinking like a Mountain for instance, is using an analogy between what is seen and otherwise hidden from our view. Professor Aldo Leopold inspecting a specimen. Luna B. Leopold in editing his father's journals noted that "Value is not measured entirely by scarcity, and possession may have little to do with the law. But to be rich in these subtle goods requires a perception that grows slowly and sometimes not at all." He, Luna, went on to say "Perception is not acquired by formal education, nor is it necessarily vouchsafed to those who are learned in the arts or the sciences. Perception is merely the recognition of ethical and aesthetic values to be found in natural things. It is clear, therefore, that perception is something that grows through various stages of development." "Aldo Leopold's journals provide some hint of the progress of this development ....These resulted from a lifetime of developing perception." Ethics in a new view. A key reason to employ symbols is to compare what is known to what is obscure, or even too difficult to understand without an image to remind us of hidden –but significant– features. The tree shown here in silhouette, also recalls a faint resemblance to how water moves across the landscape to form rivers and their tributaries. 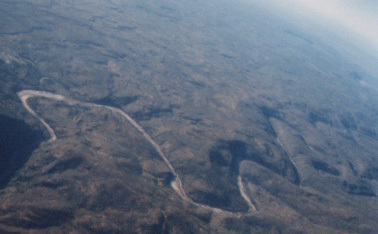 In the picture below to the right the branching patterns are less pronounced, but none the less they can be seen as the impression of surface water as it moves across the dry land of western Kansas. 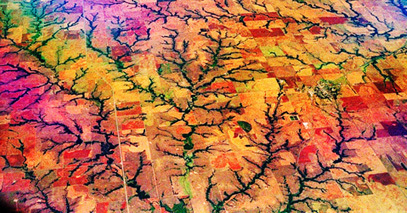 Although these are two distinctly different images, they point to how water shapes the larger patterns around us. We can use those to understand how the not so obvious relation between one thing and another may perhaps be crucial to understanding a natural condition. For instance, in ecology, the smallest and most insignificant component of a process may be more crucial to the successful functioning of a plant, animal, or bacteria, than the larger, more obvious element in any transformation. By analogy, the availability of water and carbon dioxide for plant growth in the presence of sunlight (solar radiation) is a large and important component to photosynthesis; that process in plants and bacteria that creates sugar and energy from sunlight, minerals, and carbon dioxide. But it may well be that a very tiny amount of calcium, potassium or magnesium–seemingly in an insignificant amount– has as much influence on the conversion of sun energy into matter as the shortage of water, or loss of soil moisture. Yet ample water supplies are essential for any living system to thrive. Do compare your home to the post-war model home. There is more to water than most people care to think. "There is much confusion between..." land and country. "Rio Gavilan" & "Round River"
Round River both from Leopold's Journals, explore compatible but different themes. While both the "Rio Gavilan" & "Round River" are rivers, one is literally and the other is figuratively connected to examine the coherence of nature in our lives. "Rio Gavilan" is the river of the eagles, the fish they feed on and the numerous creatures from elk to beaver and meadow mouse to heron that come to the river's edge to gather their sustenance. We are all "actors in an allegory"
"Every region has a human food symbolic of its fatness." "Food is the continuum in the Song of the Gavilan." "... instruments of the great orchestra." "a river that flows into itself"
"Wisconsin not only had a round river, Wisconsin is one. The current is the stream of energy which flows out of the soil into plants, thence into animals, thence back into the soil in a never ending circuit of life." "Ecology is destined to become the lore of Round River, a belated attempt to convert our collective knowledge of biotic materials into a collective wisdom of biotic navigation. This, in the last analysis is conservation." Alumna, Ms. DeArmas took this photograph in the oldest public Forest Preserve in the Northeast. "In our educational system, the biotic continuum is seldom pictured to us as a stream. From our tenderest years we are fed with facts about the soils, floras, and faunas, that comprise the channel of Round River (biology), about their origins in time (geology and evolution), about the technique of exploiting them (agriculture and engineering). But the concept of a current with droughts and freshets, backwaters and bars, is left to inference." 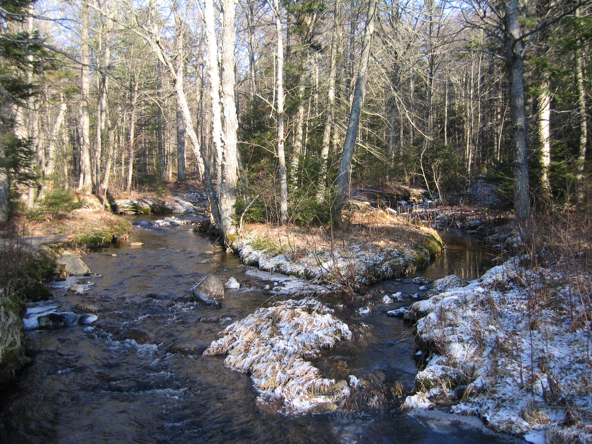 Rivers and the ecology of forests. A necessary matrix, means that you cannot separate water from land. 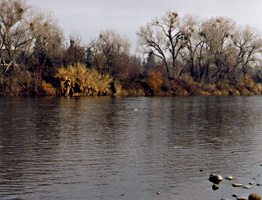 Conservation is ultimately, if not always a recognition of "the complexity of the land organism"
Levees along the Sacramento river, shown on the left at a moderate flood level, attests to the capacity and necessity of people to alter the flow and channel of rivers and thus change the landscape. Leopold always suggested that there had been far too much manipulation of natural systems for these ecological assets to yield a sustained bounty from the land and its tributaries. His essay on Round River is a testimony to his feelings and thoughts. "We have radically modified the biotic stream; we had to." And consider what he says, for example, about leisure. A river in Virginia near Natural Bridge. select a "sound bite" from Leopold's own words.